OR Call us at 732.776.8556. Please note that Reservations are NOT available on Tuesday and Sunday evenings because the restaurant is closed. Eat Well, Feel Your Best. Welcome to Cavé (Kah-vey) Bistro! We have been happily serving the Jersey Shore communities delicious, healthy gluten free meals since 2013. “You are what you eat.” We couldn’t agree more! That’s one of the reasons that we we carefully source our ingredients from local and regional farms, fisheries and specialty purveyors who share our standards for quality and handling. Our entire menu is made in-house, from scratch using nature’s finest. There is nothing artificial in our kitchen ever. We do not cut corners or skimp. We care about what you eat, and strive to provide you and your loved ones with food that makes it easy for you to look and feel your best. We use only grass fed and pasture raised meats, local and wild seafood and mainly organic produce. All of our food is gluten free, wheat free, soy free, and, mostly dairy free, with the exception of ghee and grass fed butter used in certain dishes and our Next Level coffee. At Cavé, you won’t regret not indulging in a bread basket. Our menu satisfies mostly everyone. You need not be celiac or gluten sensitive, or on the Keto or another special diet to enjoy our food and to appreciate how great you feel after you leave. In fact, most of our regular customers are everyday folks who simply care about the quality of the food that they eat, and in how they look and feel. Not convinced? See reviews on Yelp, Trip Advisor, and Google. Cavé is one of a handful of Jersey Shore restaurants that has qualified as a Surfrider Foundation Jersey Shore Ocean Friendly Restaurant. We love the beach and our ocean and are proud to support its health and cleanliness. We serve the best ingredients available. 💥GIVEWAY💥 In the spirit giving we are offering a #giveaway of our signature grain free chocolate chippers... To enter all you have to do is: 1.♥️ This post 2.Follow @cave_bistro 3.Tag 2 friends in the comments - Tag away! ( more tags = more entries ) Winner will be announced on 11/23! Stay on track and meet your health goals. Enjoy healthy and delicious gluten free meals all week long. Our customers tell us they taste better than the rest. Eat for health and weight loss by simply eating nutritiously and in healthy portions. Our regulars tell us they feel and look better when they consistently eat well. When it comes to quality, Chef Doug uses grass fed and grass finished meats, pasture-raised poultry, wild game and seafood, vegetables, fruits, nuts and produce carefully sourced from local farms, fisheries and specialty purveyors. Cavé Meals are gluten free, grain free and guilt free! Each week, Chef Doug and his talented team cook up house made healthy dishes made from scratch using the same high-quality ingredients used at Cavé Bistro. The menu is seasonal and rotates each week. Each Friday and Sunday, Chef Doug sends an email to all subscribers with the menu and ordering instructions. To place an order, simply reply via email. Orders are confirmed each SUNDAY afternoon for Monday pick up. Order by Sunday at noon by simply replying to the weekly email. Confirmation emails for each order are sent on Sunday mornings. Orders may be picked up during business hours each Monday, 12-9 pm. Eight high quality, gluten free protein-packed meals costs just $100. Pay with cash, check or by credit card at the time of pick-up. Questions? Send Chef Doug an email. Add me to Chef Doug’s weekly email list. Each week, you will get an email with the menu and ordering instructions. Thank you for joining the weekly email list for Cave Meals. You will receive an email to confirm your subscription. Select the "Add to Address Book" option during this confirmation process to ensure these emails make it to your inbox! Following his own healthy transformation, award-winning chef Doug Stehle shares his passion for eating well and feeling well. Earlier in his career, Doug managed a large-scale dining operation for Princeton's residential students as Dining Hall Chef and managed the ivy league institution's alumni and special events catering operations for more than a decade. In 2011, Monmouth University recruited Doug as Executive Chef, and later, he served as Executive Chef for Robert Woods Johnson Hospital. 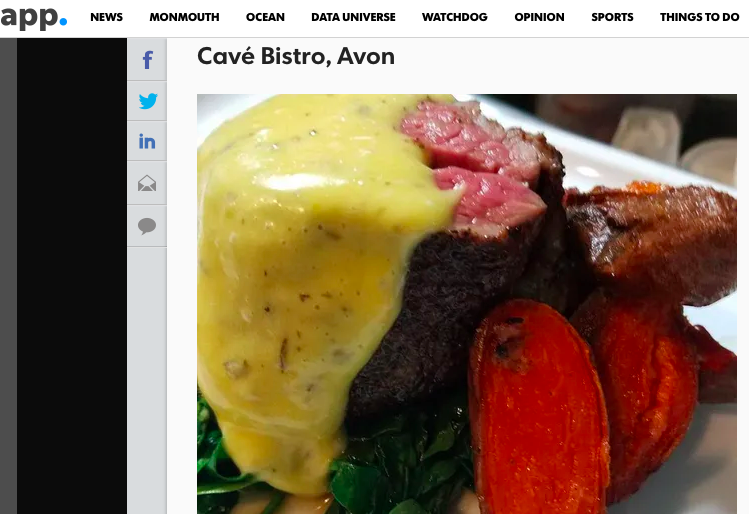 After discovering how much better he felt and looked after adopting a gluten free and dairy free diet, Doug became inspired to create Cavé, which opened as the Jersey Shore’s first gluten free prepared meal service. The response was positive. Local athletes, fitness buffs, foodies and those who simply cared about how they looked and felt were hooked. In 2013, Doug expanded, and opened Cavé Bistro, a BYO American style restaurant with a 100% gluten free menu -- and, a mostly dairy free menu. Doug cares deeply about the quality and sustainability of the meats and seafood he serves. He continuously sources the best ingredients available in order to serve the highest quality meals. He also is proud of establishing and maintaining a fun and rewarding restaurant for the entire team to be proud to call their work homes. 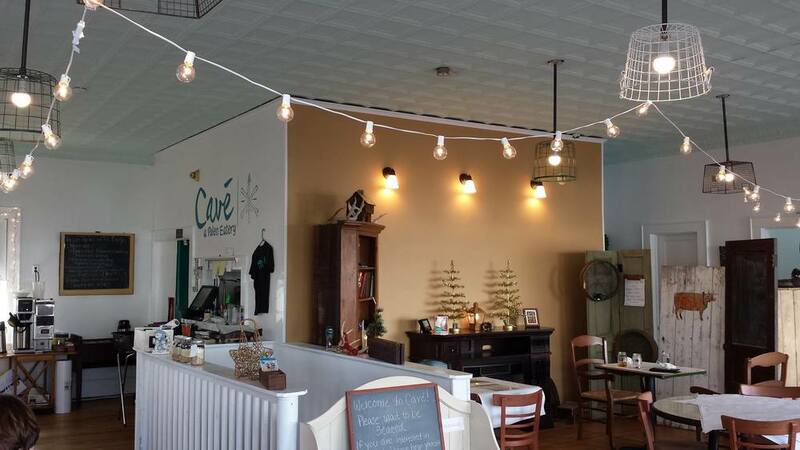 Cavé Bistro is one of a handful of the area’s restaurants that has qualified as a Surfrider Foundation Jersey Shore Ocean Friendly Restaurant. Doug earned his culinary arts degree at Atlantic County Community College in 1994 and has been a chef for the last 25 years. He has been a silver and bronze medal winner in various American Culinary Federation competitions. But mostly, he is proud of the loyal following he has created and the customers and friends he works so hard to keep satisfied. Give the gift of well being and good health! We offer Cavé gift cards in any denomination. These are available as a physical card to be presented, which can be purchased over the phone or in the restaurant. We are happy to mail gift cards anywhere in the continental United States. Otherwise, they can be picked up at the restaurant.. Gift cards may be used in the restaurant, on the Cavé Prepared Meals service, or an upcoming Master Class. To order, please call us during business hours and we’ll process your request 732-776-8556. Cavé is the perfect spot for smaller, intimate affairs such as birthdays, showers, rehearsal dinners, anniversaries, workplace parties, or any special occasion. We can accommodate up to 32 guests who plan to be seated. At Cavé, we work with you to make your event unforgettable. Chef Doug will work with you to plan and prepare a special menu, using the finest ingredients available. We provide an event planner to work with you before and onsite so the event unfolds as you envision, and so you can enjoy yourself, leaving us to accommodate the needs of your guests. Because of our size, a buyout is required, ensuring our attention is 100% focused on your affair, and the restaurant is exclusively yours for the duration of the event. To inquire about booking your private party or event, please email your requirements. Valentine's Day dinner: 5 Shore restaurants to visit on Feb. 14 - Read the full story at the app. Want to eat healthy? Try these NJ restaurants - Read the full story at the app. 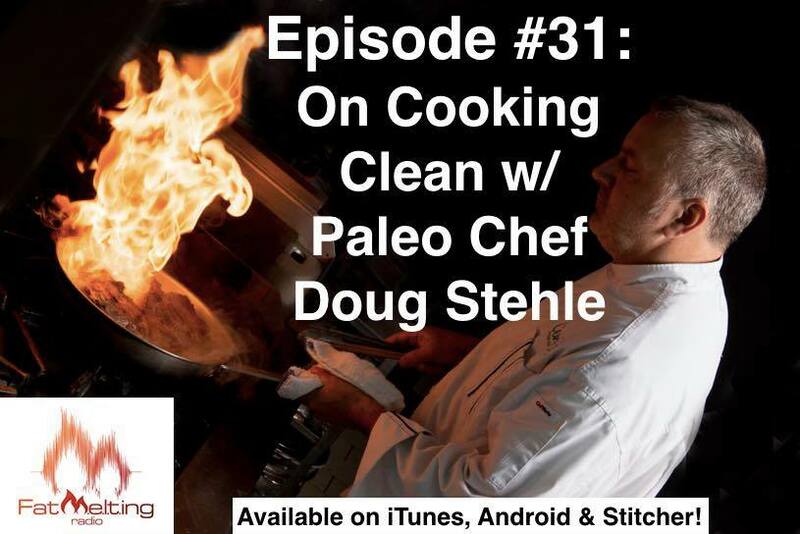 Listen to Chef Doug's interview on “Fat m.e.l.t.ing Radio” podcast for his tips on how to cook clean and for some delicious recipe ideas!